It meets the requirements of the customer relationship management system as it has the advantages below over other systems. It's easy to use and navigate. It's easy to setup. It has easy admin navigation for better prospects. The quality of support is immensely appreciated as the support team provides quick resolutions. It makes it easy to do business with other stakeholders. It could improve on its integration with other systems. It's a really great system for small to medium organizations that are willing to spend some time thinking about how their workflow can be improved by designing processes which will allow them to streamline and automate their business. For people who are not serious about making a commitment to bettering their business, Workbooks may not be a correct fit. For instance there are a lot of features which many people think they don't need, but they haven't really spent the time to figure out what the needs of the business are. The nice thing about Workbooks is that you can turn off things you don't need, and then when the business demands, they will be there for you to utilize. Intuitive and provides a great user experience through its simple web design; takes no time to set-up and jump right in. Offers integrations with multiple other software platforms to provide a flexible and inclusive business tool. One of the best options available at this price point; plans available to add more features to adjust to your business needs. The more features needed, the pricier the plan. I'd like to see the multi currency handled better. If I want to see a view that contains customer finance data from multiple regions, I can't see a total in GBP unless I create a report. We found it difficult to manage support cases in Workbooks and the support team has had to move to another platform. Maybe looking at what ZenDesk is doing would be a good next step here. I'd like to see a way of adding multiple contacts to a lead record. At the moment, every person has to have their own record as there's only space for one person and that means multiple records for one company. There was a little bit of a learning curve and some bumps along the way to managing this platform, but AgileCRM appears to be responsive to any challenges that arise, which I consider to be of vital importance. Put simply, we are happy with the product. This is a feature rich, well organized and easy to use platform. The training sessions are very helpful, because you have specialist that is available to answer any questions, guide you and coach you on how to dominate a certain feature of the platform. That being said,Whenever I have an issue that needs to be resolved, I can send email or call a support line. I usually use the support line. Workbooks CRM never let me down. The performance of AgileCRM has been acceptable to date. I'm pleased with the ability to modify leads in the system and search for them and add groups to campaigns. The online help isn't very helpful and the contact I've had with the support team left a lot to be desired. Each section of the AgileCRM platform has an instructional video that describes in detail all of the features of that section. I found this to be very instructional way to learn about each section. Whenever I had more questions, I could always schedule a conference call with a tutor..
Workbooks online trianing does what it needs to; but some training will always be better suited to face to face..
Agile CRM is much less expensive than Salesforce. It might not have all the potential of those thousands of add-ons, but for those who have basic needs – and the need to customize to some extent, it more than delivers.Agile CRM has more advanced features, particularly around marketing automation, and hub spot does. 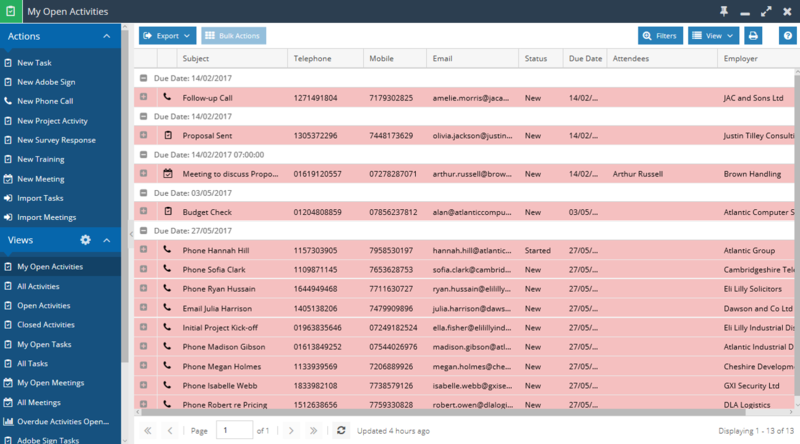 While hub spot is free for the CRM element, using the other tools that come standard and agile CRM raises your cost considerably.Outlook for business just isn't organized in a friendly enough way for you to see who you know and to keep things current. This products Starts with a free Limited version. You can upgradeTo an affordable paid version with minimal features. There's also an enterprise version which is what I have. It's much more expensive, however it allows me to access the full range of features available. Agile CRM is such an integral part of our business, that I can imagine life without it. If we didn't have it, it would mean missing important calls, not following up on key leads, and not having current contact information for many of our clients, vendors, and prospects. In addition to cost savings, agile CRM also helps me save time. It's very responsive, so updating records is not a hassle. I particularly like being able to import details from someone's LinkedIn page without having the type of thing. Single data set enabling more scope for data analysis across the organisation. Enabled increases in income from multiple income streams.